It'd been years since I'd had a good dosa--I think we were still in the first G.W. Bush administration the last time the savory Indian treat touched these lips! 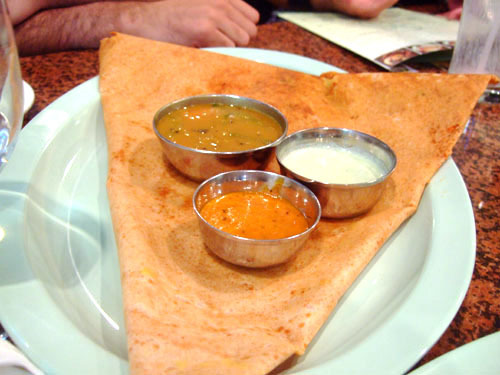 A dosa is, of course, a crepe-like dish made from a batter of water, rice, and urad beans (black lentils). The batter is spread over a tava (flat griddle), and fried with ghee (clarified butter) or oil until crisp and golden. 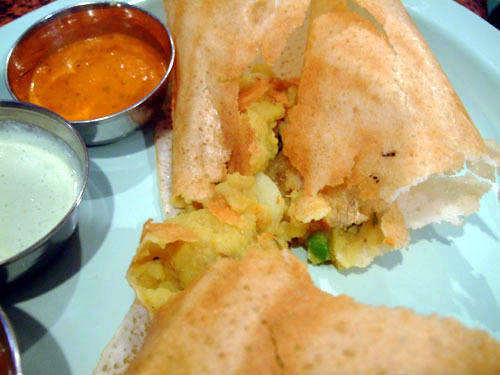 The dosa is a staple, and icon even, of South Indian cookery. 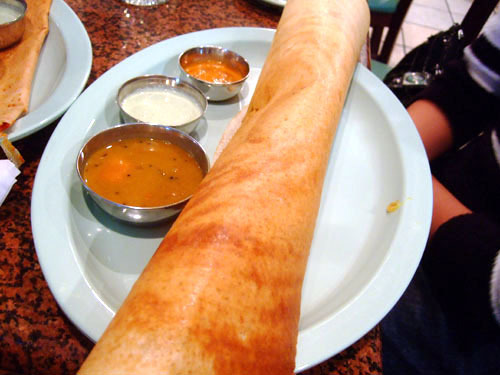 The reason for my dearth of dosas is that they're not a popular item at Indian eateries here in the US, which tend to focus on North Indian food. 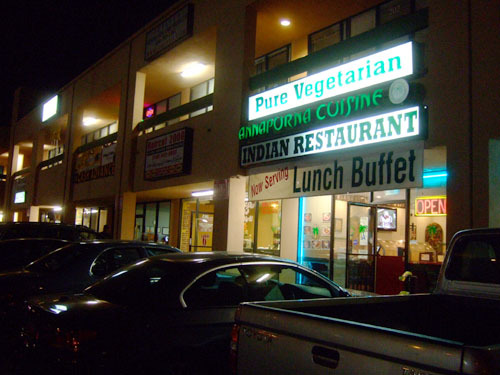 As such, if you're seeking dosas, you usually have to look for places specifically specializing in South Indian or vegetarian cuisine. Annapurna (a name that refers to an avatar of Hindu Goddess Durga, responsible for agriculture) is one such restaurant. I was brought here by Jai, a reader whom I'd met previously at The Tasting Kitchen in Venice. We'd initially agreed upon Udupi Palace in Artesia, but switched to Annapurna last minute, as it was more centrally located for some of the other members of our party (which included Dylan Hallas, currently sous chef at TTK, and formerly of The Bazaar, Providence, and Trattoria Tre Venezie). 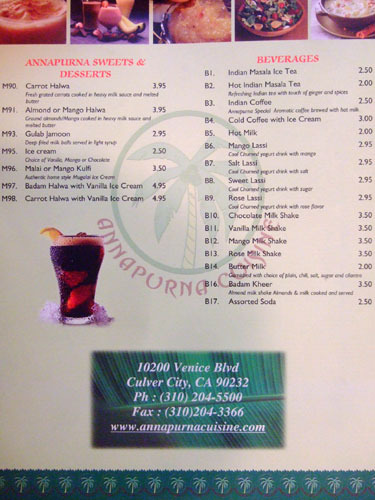 Annapurna is situated in the Venice Plaza strip mall, just one street over from St. Augustine Church and not far from the restaurant hot spots near Culver Junction. Parking is provided in a private lot, with street parking available as well. ...Except for the computers integrated into the three booths. I don't think I've ever seen anything like this before. I guess it does makes it easier to live tweet your meal! 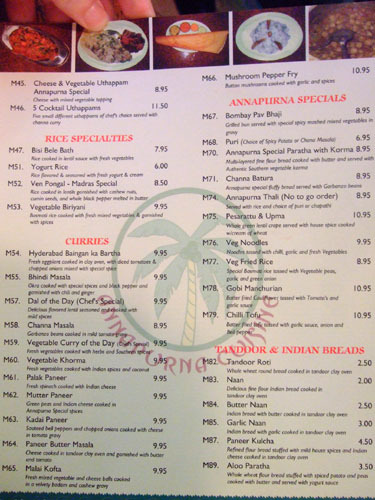 The entire menu is shown above; click for larger versions. As you can see, Annapurna sports a healthy dosa list, and is heavily biased toward South Indian specialties, though some of your more typical dishes are certainly represented as well. 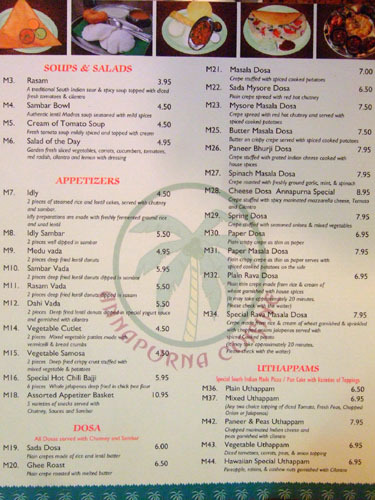 It is important to note that the menu is completely vegetarian. 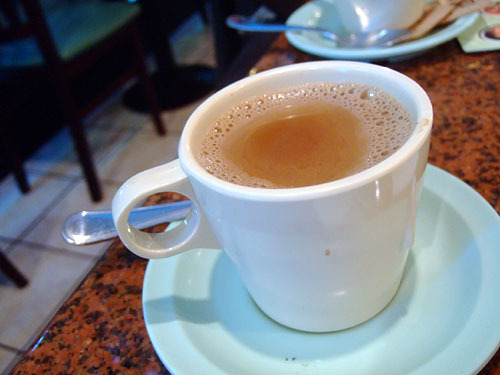 There's no alcohol served here, so most of us decided to subsist on water and Hot Indian Masala Tea [$2], basically chai mixed with ginger and other spices. 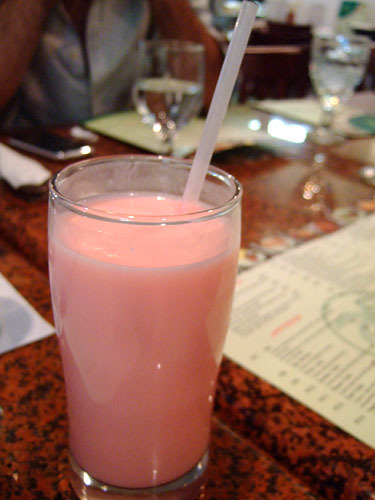 Jai, however, decided on the flamboyantly pink, Pepto-Bismol-tinged Rose Lassi [$2.95], a delightful drink flavored with rosewater syrup. 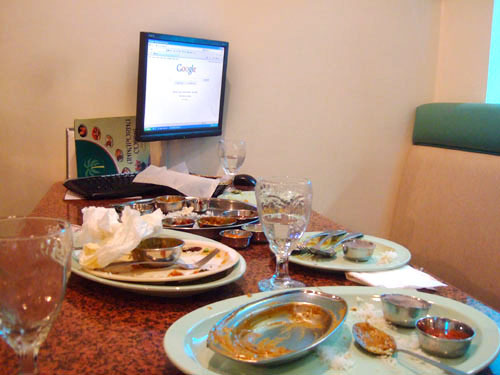 To begin, we ordered up some idlis, a South Indian snack of spongy, savory cakes made from a rice and urad batter, which is subsequenty poured into molds and steamed. Here, we have two pieces, soaked in sambar. Sambar itself is a stew-like dish made with toovar (pigeon pea) dal, tamarind, vegetables, and spices. 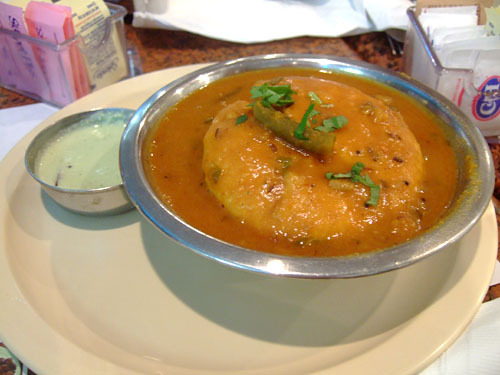 The idlis themselves were mild in flavor, with a light, fluffy texture. They paired beautifully with the sambar, which lent an earthy, hearty, subtly spicy flavor to the cakes. With origins stemming from the Udupi subcuisine of South India, the popular masala dosa starts with your basic sada dosa, but adds a stuffing of cooked spiced potatoes, onions, and peas (before the invention of the masala dosa, the potato commixture was typically served on the side). Here, the dosa was accompanied by sambar (described above), a red chili chutney, and a coconut chutney (I believe we detected green chili and mint in there as well). The masala stuffing was reminiscent of that from a samosa, and contributed a delicately spicy, lightly vegetal sapor that deftly offset the flavor of the dosa itself. Meanwhile, the firm, somewhat crunchy texture of the crepe mixed things up texturally. Delicious. 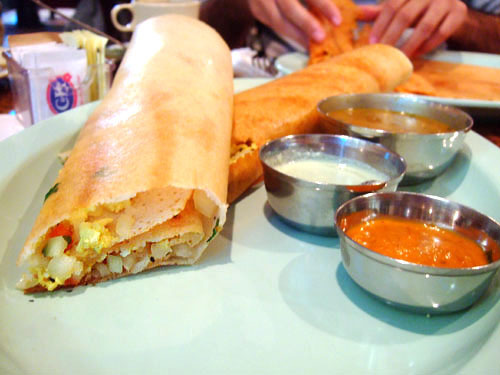 The Mysore Masala Dosa (named after the second largest city in the Indian state of Karnataka) adds red hot chutney in with the bhaji (the aforementioned spiced potato amalgam). This, obviously, resulted in a spicier flavor profile compared to the standard Masala Dosa. Note, however, the drastically different shape of the crepe; it's folded rather than rolled, contributing to a softer, less crunchy consistency. Our next variation, inspired by the popular dish Egg Bhurji, removes the bhaji and instead substitutes a mixture of paneer (cheese), tomato, onion, and cilantro. You usually see paneer in cubed form, but here it was presented in crumbles, and really resembled scrambled egg in appearance, taste, and texture. The combination of ingredients here really gave this dosa a light, familiar flavor profile, one that we all seemed to enjoy. 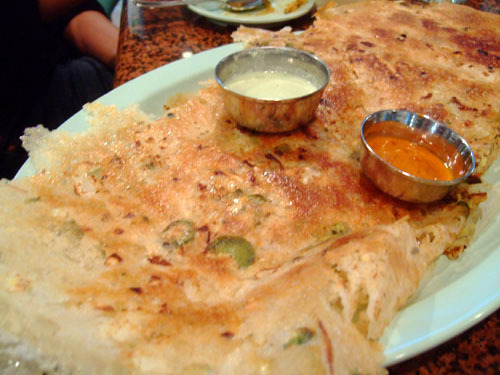 Now we have the rava dosa, which, as the name implies, is made from rava (semolina). The version we had also included jalapenos in the batter, and was stuffed with the bhaji potato mixture. The use of rava made for a somewhat grittier, more rustic crepe, which was also a bit spicier due to the peppers. And finally, we have yet another dish made from that ubiquitous batter of rice and urad dal. 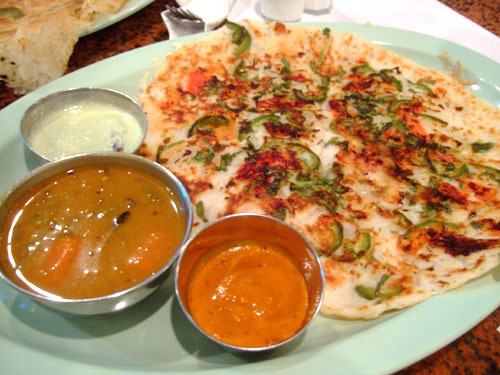 Described on the menu as a sort of Indian pizza, the uttapam incorporates ingredients right into the batter itself, and is cooked to a much greater thickness (thus lacking the dosa's crispness). A variety of toppings can be used, but in this case, we had tomatoes, onions, and jalapenos. These three items really did result in a delectable, slightly pizza-esque flavor. Even Jai, who's not normally a fan of uttapams, enjoyed this. 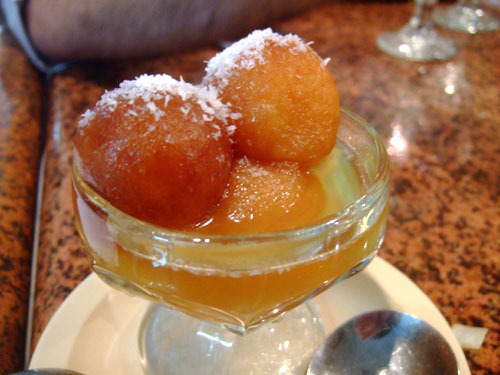 Dylan was keen on trying the gulab jamun, so we ordered up a set. It's basically a dessert consisting of deep fried balls of khoa (milk solids), slathered in a rosewater syrup. As expected, the spheres were warm, buttery, and tooth-achingly sweet. However, I would've liked a firmer texture for the globules. 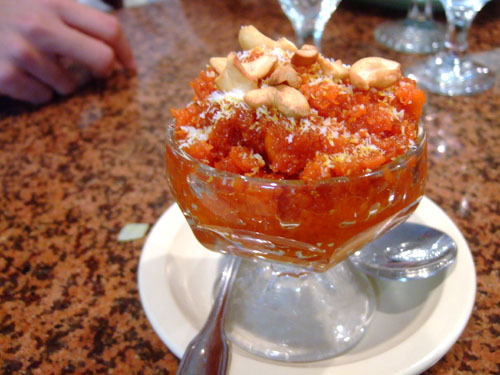 This dessert consisted of grated carrots cooked in condensed milk and ghee (butter), resulting in a hot, heavy, luxurious, immensely sugary, pudding-like confection. 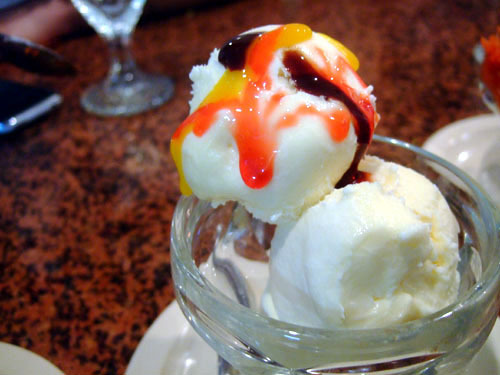 It was almost too much on its own, so the temper provided by the ice cream (drizzled with chocolate, mango, and rosewater syrups) was absolutely key. We also appreciated the hot/cold contrast inherent in the combination. 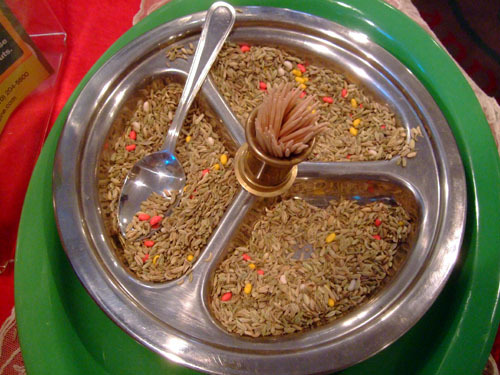 On the way out, you might want to grab some mukhwas, a blend of various seeds, including fennel and anise. The admixture is used as an after-dinner snack and digestive aid. After we strolled out of Annapurna, Jai spotted a small Pakistani market, Asia Foods, in the same mini-mall. 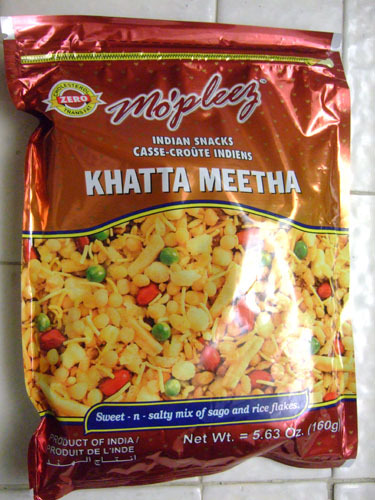 We all went inside, and for $1.29, I picked up a packet of Mopleez Khatta Meetha, a snack mix that Jai's sister Jasleen (who, by the way, was the inspiration for Boutique Jasleen in South Pasadena) described as "Indian crack." I didn't think that it was quite as addictive as crack cocaine, but it was a nice mix of sweet and salty, good with a light beer. First off, Pepto Bismol is all sorts of deliciousness. Just because I like my drinks pink and sweet... anyways, try the meetha with a glass of scotch sometime, ideally Lagavulin 16 (though every Punjabi in the world drinks Johnnie Walker's Black Label almost exclusively!) P.S. I'm glad you weren't left craving meat after the meal even though I left my shirt half unbuttoned for you. And P.P.S. Thanks for plugging my mom's store! I used to stage at Providence one day a week for a couple months while I worked a second job that paid better and supplied me with coke. I quit Tre Venezie 3 months into it because it was my first cooking gig out of school and I couldn't handle an irate Northern Italian who funnelled his resentment toward American culture into me. I worked at the Bazaar legitimately and competently but in a year or so I'm going to wipe it from my resume so I can more efficiently forget the whole thing ever happened. Umm... do I need to teach you ab something called discretion, Dylan? I meant the soda, of course. Dylan: So you're His Dudeness? You've been reading for some time then I see! Have you worked anywhere else other than the four places mentioned? We're way too cheap for gold or blue. Watch that Russel Peters clip again!